The Scoop: For centuries, the Slovenian capital of Ljubljana and its surrounding regions have inspired romance. Today, locals and tourists alike host weddings in the area’s majestic medieval castles and stop to hang padlocks of love on Butchers’ Bridge. The city isn’t all about tradition, though. Innovative eateries, tours of natural wonders, and quality hotels are available for couples who want a luxurious, modern experience. Ljubljana’s diverse attractions and beautiful scenery make it a clear choice for those planning a passion-filled getaway. Many brides, and even a few grooms, dream of having a fairytale wedding in a castle. Typically, those dreams don’t come true, but they can in Ljubljana, the capital of Slovenia, which borders both Italy and Austria. 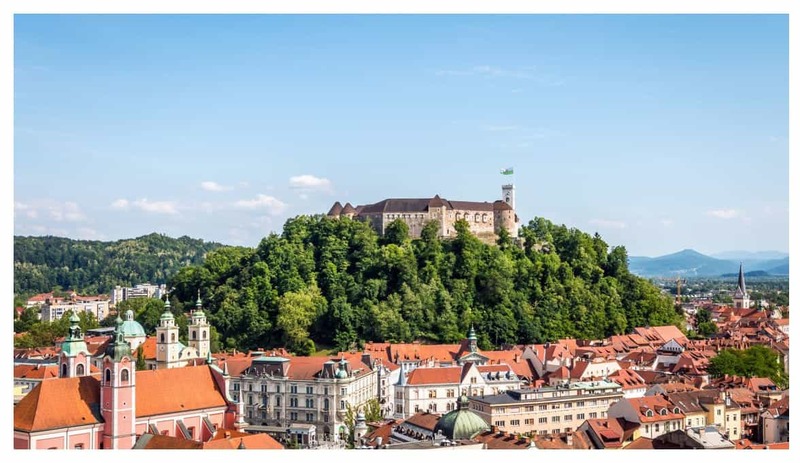 The city’s famous Ljubljana Castle is the medieval centerpiece of the city’s Old Town, and guests can look out onto the snow-capped Alps from the castle’s windows. Inside, couples can choose from a variety of halls that provide modern comforts. Wedding ceremonies can be held in any of these halls, and many couples choose to move outside for their wedding receptions to provide guests with stunning views of the city. It’s about as close to a storybook nuptial as a couple can get. Other venues in Ljubljana also make for picture-perfect wedding locations, including the Grand Hotel, built in 1905, and the Union and the Antiq Palace, a restored 16th-century manor. Uroš Črnigoj, the Digital Content Manager for Ljubljana Tourism, said a lot of couples come to the city to plan their weddings because of its romantic flair. Since Slovenia became an independent republic after the fall of Yugoslavia in 1991, Ljubljana has been restored as the nation’s capital. In the nearly three decades since, the city has become a popular tourist destination because of its friendliness, accessibility, and well-preserved history. It’s also appealing because of its location in Central Europe, which provides easy access to sites in Slovenia and beyond. Ljubljana bills itself as a city for romance because of its many nods to love and companionship. Many bridges cross the Ljubljanica River, which runs through the heart of the city. The Dragon Bridge, built at the beginning of the 20th century, is named for the sheet-copper dragon statues that have become a symbol of the city. Another bridge symbolizes something softer: love. 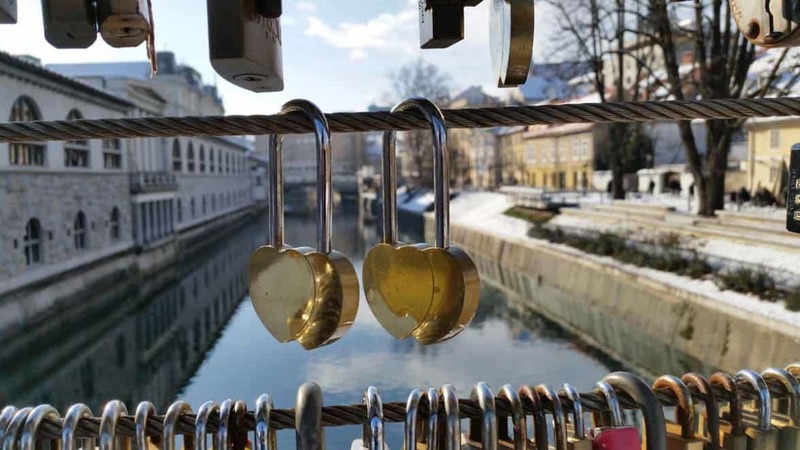 Residents have dubbed Butchers’ Bridge “The Love Bridge” because it invites couples to hang padlocks on crossing wires as a sign of their commitment to each other. After couples have hung a lock on the bridge, they can take a cruise down the river to see all of the city’s bridges, cafes, and other riverside attractions. And couples can be inspired by visiting the statue of the famous romantic Slovenian poet France Prešeren (1800–1849) located in Ljubljana’s town square. Across from the statue of the poet is another of his muse, Julija Primic, whom he loved but who never returned his affections. Uroš also recommends attractions that are off the beaten path for couples who have already seen the city’s main attractions. After a day of sightseeing, you can have a traditional Slovenian dinner at The Restavracija Strelec, an authentic Slovenian restaurant that serves up medieval-inspired castle dishes like trout, salami, and roasted apples. This one-of-kind, multi-course dining experience is only possible in Ljubljana. Though it is possible to get around Ljubljana on your own, visitors can always embark on a guided tour to see more than they would on their own. For those who want to stay in the city, the Moustache Tour is an offbeat experience that introduces visitors to some of the city’s more unusual attractions. Inspired by three of the city’s most famous mustachioed artists — Jože Plečnik, Ivan Cankar, and Rihard Jakopič — the tour stops at the National Gallery of Art, the Križanke theater for a play or concert, and the International Centre of Graphic Arts (MGLC). Slovenia also has many notable wine regions, and interested couples can set out on the Ljubljana Wine Experience tour to try a variety of wines grown in the region. Located at the intersection of several of Europe’s most fertile wine areas, the tour allows guests to try nine wines from the country’s three major wine regions. Guests also get a ride in a funicular, or mountainside railroad car, to the Ljubljana Castle. Uroš also recommends that visitors use Ljubljana as a starting point for visiting other parts of the country. “The city’s in the heart of Slovenia, which enables you to visit great places that are all reachable in an hour-and-a-half drive, at most,” he said. One way to see more of the country in a short time is by taking the Slovenia in One Day tour. The trip takes you to Bled, a town located a short distance from Ljubljana that’s home to a picturesque medieval castle on an island in the middle of a lake. Also on the trip, you’ll see Postojna Cave, a 24,000 mile-long cave system that’s a natural wonder in Central Europe. Ljubljana Tourism is also planning to make the city even more accessible to foreign and Slovenian visitors. In the past few decades, Ljubljana has established itself as a modern European city that continues to inspire romance. For example, the Hotel InterContinental, Ljubljana’s first five-star hotel, opened in 2018. With simple and chic rooms overlooking the city’s hills and squares, the new hotel epitomizes the city’s balance of old and new. The city’s most popular restaurants strike a similar balance. Sveti Florijan is a contemporary, colorful establishment that’s a bistro and deli during the day and transforms into a nightclub in the evening. Food offerings include homemade pasta with lobster, saffron, and squid ink, and venison loin with pears, mushrooms, and croquettes. Housed in the Grand Hotel Union, Atelje is another modern take on classic Slovenian fare. The restaurant honors tradition by baking its own bread, curing its own cheeses, preserving its own vegetables, and presenting these dishes in a sophisticated, upscale setting. After taking in some of the city’s more traditional arts and culture, tourists can visit cutting-edge arts venues. One of these is Metelkova Mesto Alternative Culture Centre, a colorful, graffiti-laden former army barracks that’s home to music clubs, art performances, and exhibitions. The city’s commitment to innovation — without forgetting its heritage — is one of the reasons that Ljubljana has become a preferred stop for many couples from around the world.